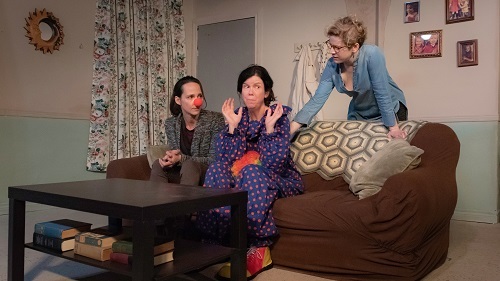 Her Inside Life and Kill the Poor, presented by Low Rise Productions and Leroy Street Theatre respectively is curious as a double bill. The two plays are from The Parkdale Palace Trilogy by celebrated Canadian playwright George F. Walker and have the right mix of contrast and similarity for the juxtaposition to be interesting. Both works are also substantial enough to be standalone pieces. Playgoers have the option of seeing the show as a double bill or independently. When I say substantial I mean action-packed but I do also mean long as a double bill. Both works are well over an hour long. With an intermission that went on for over half an hour, we were at The Assembly theatre from 7 PM to 10:30 PM. To be fair, I am a seasoned opera goer and no stranger to a lengthy show. Still, I was not expecting a piece that long and I was pretty hangry by the end. Thanks to two very clever scripts and outstanding performances, I was a captive audience for most of the show. The storytelling was satirical and witty, laugh out loud funny yet provocative. Both tales are told in the same living room, with different accoutrements. Her Inside Life tells the story of a woman who is living in the community under strict supervision because she has murdered her husband and brother-in-law, believing them to be murderers for hire. She is supported by a social worker and a daughter who is walking her own tightrope of sanity. It transpires that her supervision is not strict enough and that reality is not as straightforward as it seems. Kill the Poor takes us into the living room of a young couple who are struggling in more ways than one. In addition to the fact that they are chronically poor, they have just had their lives shattered by a horrific accident. With sinister forces closing in, they cling to any life raft they are offered. Their reliance on the kindness of strangers has drastic consequences. The actors in this show are masters of comedic timing with the ability to transition from dramatic intensity to hilarity and hijinks on a dime. Catherine Fitch is glittering as the protagonist in Her Inside Life. Her brilliant madness is liberating and incandescent and elicited many belly laughs from the audience. It was very clear that she had a great deal of fun playing this role, yet still brought a great deal of compassion and humanity to this anti-heroine. Still, I wondered how much actual research the playwright had done about the type of mental illness that could cause one to give way to homicidal impulses. The character is enjoyable and makes her point, and yet was not entirely credible. I get that credibility is not always the point, but I could not help but feel like real people involved in the tragedy that has been in the news recently are overlooked somehow. My companion and I agreed the play goes on about three scenes too long, giving us an opportunity to focus on our rumbling stomachs, rather than the action on stage. I was absolutely transfixed by Anne van Leeuwen as Lacey in Kill the Poor. Her stage presence is magical and her face is pathos personified. I enjoyed this play very much. It has a lot to say about the cycle of poverty and violence and the faint hope of escaping the web of marginalization. Her Inside Life and Kill the Poor are definitely worth seeing as a double bill for theatre goers with decent stamina, and a great opportunity to check out some of the excellent food available in Parkdale before the show. Her Inside Life and Kill the Poor is playing until November 18, 2018 at The Assembly Theatre (1479 Queen St W). The first show starts at 7:00 PM on October 27, 29, 30, 31 and November 1, 2, 3, 6, 7, 8, 9, 10, 11, 13, 15, 16, 17, 18. The shows alternate the 7 PM start time. See website for details. Ticket prices range from $20 – 60. Tickets are available online, or by phone at 1-800-838-3006.